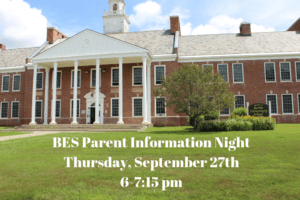 Parent Information Night for grades PreK-5 will be held on Thursday, September 27 from 6 p.m. to 7:15 p.m. at Berlin Elementary School. This is a great opportunity for families to hear from their child’s teachers and learn all about their programs. Childcare will be available from 6 p.m. to 7:15 p.m. for school aged children. Please fill out the childcare registration form to reserve your spot.